A couple days ago, I attempted to predict what Sean Monahan’s new contract with the Calgary Flames might look like. Calgary should go long-term, extending Monahan, a restricted free agent, for six or seven years, somewhere in the neighbourhood of $6 million to $6.5 million per season. Sean Monahan has proven he’s a legit first-line center. At that time, I also called Monahan the workhorse of the Calgary Flames. He’s not short on talent, but his accomplishments go far more unnoticed than one of his teammates — Johnny Gaudreau. Gaudreau is a highlight reel in the making. 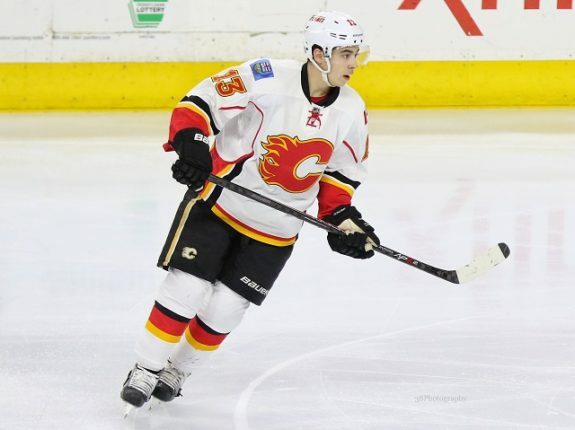 Of the two, he’s easily the flashier player and like Monahan, Gaudreau has established himself as a building block in Calgary and an essential piece the Flames will build around for years. Also like Monahan, it makes sense to provide Gaudreau with a long-term contract, lock him up and keep him as part of the fold for as long as possible. Calgary has employed some incredible talent, such as Jarome Iginla and Mark Giordano, but it looks like Gaudreau is prime to be the recipient of the biggest contract in Calgary Flames history. At 22, Gaudreau had one less season than Monahan in the NHL to prove his value, but in those short two years, it’s clear he’s a dynamic talent. Gaudreau couldn’t have had a better final season leading into a contract year — he placed seventh in overall NHL scoring. His small stature hasn’t detracted him from becoming Calgary’s first option on offence. With 30 goals and 78 points in 79 games in 2015-16, along with 24 goals and 64 points in 80 games during the 2014-15 season, Gaudreau is particularly spectacular on special teams and clearly Calgary’s best offensive weapon. He’s about to get paid like it. Players who put up the most points tend to get the highest annual salaries and overall, the biggest contracts. Sidney Crosby, Alex Ovechkin and Vladimir Tarasenko are paid because they contribute more than most offensively. I did some comparables with Sean Monahan and much of the same holds true for Gaudreau, with one exception. In the same realm as Tarasenko, Gaudreau is a point-producing machine. Tarasenko received an incredible bump in salary and someone Calgary would prefer not to have to compare Gaudreau’s contract terms. However, Tarasenko is likely going to be the measuring stick. It’s the type of contract that affects the entire Flames roster and potentially one of the reasons Flames fan have mixed reactions to the signing of free-agent Troy Brouwer. In predicting Gaudreau’s next contract, the Flames will need to understand that Gaudreau is going to get paid … and paid well. It’s how they manage his contract alongside the contract of Monahan, the eventual signing of Sam Bennett and a Flames team that has $58.3 of the $73 million in available cap space already committed. It is imperative Calgary keep Monahan and Gaudreau at a combined hit of under $15 million per season. With that in mind, I’ll say $7.25 million over seven years. But it wouldn’t surprise me in the least to see him garner $7.5 over the same time period. If by chance, the Flames can get both Monahan and Gaudreau in the same room and convince both to take $6.75 to no more than $7 million deals over six to seven years, Calgary has to consider that a win.